As I’ve said in the character page, Boot is one of my oldest friends. That artist first dreamt of getting steel capped boots when she was about seven years old, living in a place called the Pocket Valley. She loved hanging out with the donkeys, but sometimes the donkeys liked to stand on her bare feet and lean, she liked the idea of the invulnerability of steel capped toes. When she bought steel capped boots with one of her first pay cheques as an adult the person at the working gear store kindly pointed out how steel capped boots wouldn’t save you all the time, but there is still a wonderful feeling of invulnerability having your toes protected by a cup of metal. The weight of a work boot also makes jumping harder, but it does mean everything feels feathery light when you change into sneakers. 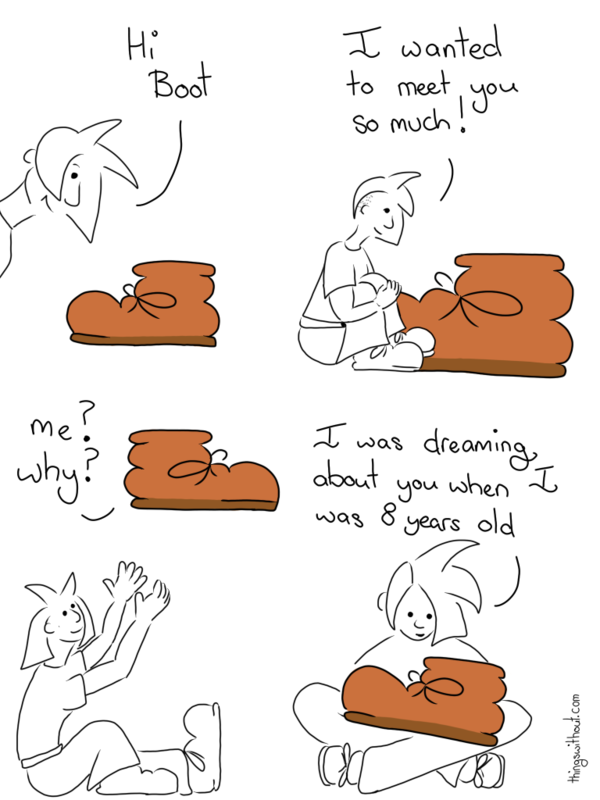 Her boots were made free from any sweatshop labor and were just as wonderful as she had hoped. Liz: I wanted to meet you so much! Liz: I was dreaming about you when I was 8 years old.